Looking for that one inexhaustible topic that you can apply to just about any scenario? We’re all faced with stress, both good and bad, every day. From fast-approaching deadlines to family vacations to tax audits to raising puppies – everything has its own set of complications that can be stressful if you lose your positive focus. Combine stress with what drives many readers online in search of quality, informative content – solutions to their problems, to meet their needs, or to achieve their wants. 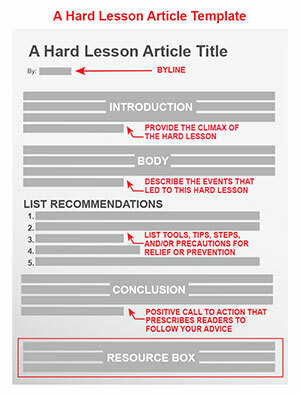 Targeting your reader’s stress and providing solutions can yield dozens of article ideas. 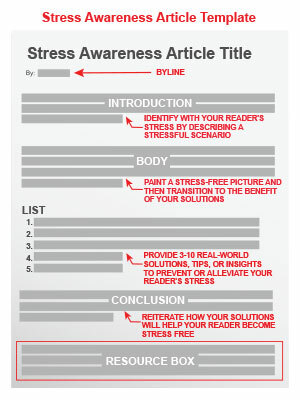 Use the Stress Awareness Article Template to commiserate with your readers and offer proven solutions to overcome stress. Lessons come in many guises. Your mother, your father, your teacher, your mentor, your coach – anyone who ever taught you – may have missed a few critical details that you had to learn on your own. These are the insights your readers want – the not-so-obvious lessons everyone forgets, but are major steps toward achieving a goal or benefit. Whether found through hard experiences or those “Eureka!” moments, consider the lessons everyone neglected – from experiences to improvements to shortcuts. 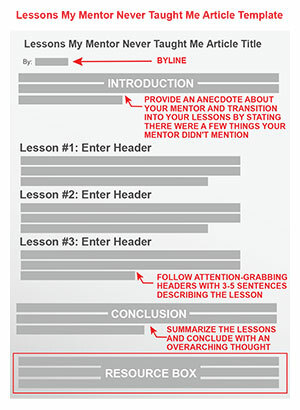 Then pass these lessons on to your readers using the Lessons My Mentor Never Taught Me Article Template. Introduction: Provide a personal or professional anecdote about your mentor (e.g., a coach, a teacher, or even a parent) and how much value they contributed to your expertise. Switch gears and transition into your lessons by stating there were a few things your mentor neglected to mention. Share how readers can benefit from the lessons you’ve learned on your own. Unsure about benefit-oriented writing? It may seem like you’re dangling a carrot in front of a horse, but it truly works. Think about it: Your readers may need a little push or incentive. Painting a picture of success by describing the “carrots” will help them decide whether the effort is worth their trouble. It may also show they’ve been missing out on an opportunity. What your readers need is concrete evidence – if they perform the task, are they really going to get the carrot? That’s where you come in. Using your Expert Author status, experience, and insights, you can provide solid evidence from personal anecdotes, case studies, analysis, and more to motivate your readers into performing an action or believing in an idea. 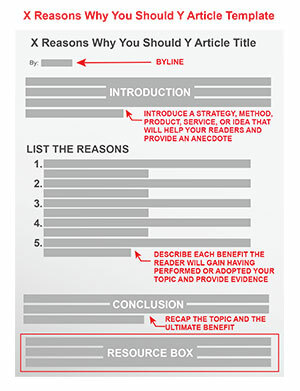 Use the X Reasons Why You Should Y Article Template to show your readers how they will greatly benefit from performing a particular strategy or method, using a product or service, or even adopting a different point-of-view. Getting started is the hardest part. Perhaps it’s because of a lack of resources, not knowing where to begin, or even a fear of failure. That’s where you can alleviate and reassure your readers: Hindsight is 20/20. Have you ever heard someone say, “If I could start over again, then I’d …”? Whether it’s the result of failure or innovation, successful individuals re-tune and improve their processes to increase speed, skill sets, and even to derive pleasure. One might even say that success is born from the constant reinvention of process – a cyclic beginning. Use the example of your beginning to help shape and influence the positive start of others. 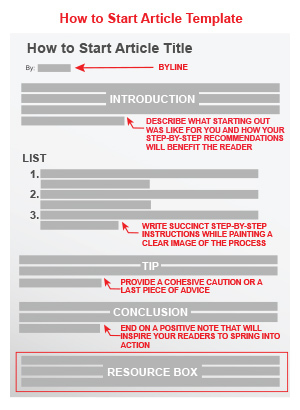 For your next article, use the How to Start Article Template to show your readers the steps for their next beginning. Routine: A sequence of actions regularly followed. Finding the right balance in your routine can make a huge impact on your personal and professional life. Even the smallest change can make a huge impact on your success. Over the years, what changes have you made to your routine that have positively affected you in your personal and professional relationships? Did waking up earlier to have more “quiet time” help motivate you? Run, walk, or mediate, did changing your exercise routine increase your productivity level? Does answering emails before lunch affect your business or personal relationships positively? Were brainstorming or problem solving sessions more effective after restructuring meetings? Does taking one hour to discover something new every day help you strengthen your expertise? 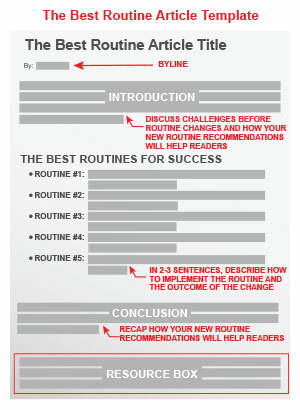 Help your readers save time, effort, and reach success with this easy template! Simply recommend the strategies, methods, and other changes to your routine that made the biggest impact on your success. Reading is a fantastic way to improve your knowledge base, enhance your problem solving skills, reduce stress, and even better your writing style. Finished reading? Expand your portfolio and leverage your credibility by taking a moment to write a book review! Why Should You Write Book Reviews? Writing book reviews helps you keep tabs on your niche by being involved in the conversation as well as network with fellow members of your niche. It’s also an easy way to build your exposure with your audience as a credible expert. 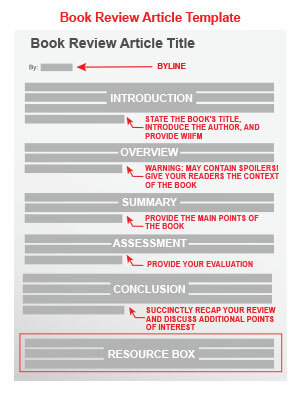 Introduction: Be clear about what book you are reviewing. State the title and introduce the author. Provide a hook that illustrates what it means to the reader (i.e., “what’s in it for me”). Try to count all of the tools you use everyday in your personal and professional lives. It’s nearly impossible to think of them all! From mobile apps, vehicle features, kitchen gadgets, to the toolbox in my workshop, I’d be hard pressed to think of any part of my day that’s not accompanied by some sort of tool I use to communicate, monitor, fix, or simply increase my efficiency. And you would too. As a professional in your niche, you have likely amassed several tools you couldn’t do without or have given some great insider recommendations to your customers. 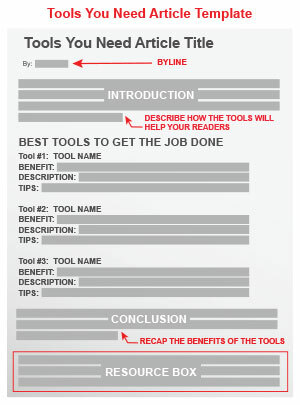 Use these tools as inspiration for your next article template to help your readers effectively achieve a particular task or goal. Don’t Know What You Should Write For Your Next Article? We all need more time. Whether it’s too little or the loss of it, time is at the center of our troubles. You can teach your readers great methods that show them how to better manage their time, but what they really want is a strategy, here and now, that gets them out of the time mess. They want shortcuts, so why not give them what they want? A shortcut is a route, method, or means of doing something more directly and quickly. It may not always be the most thorough route, but it typically saves time to get the job done so you can focus your valuable time on other priorities. 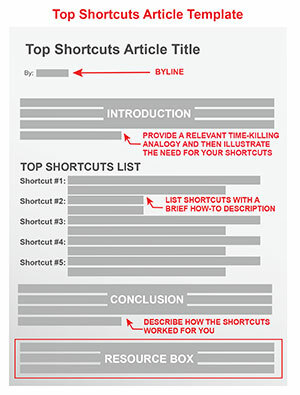 Brainstorm shortcuts you have used or you currently use and then use this template as a guide for your next article writing session! Even the most successful chefs practice with recipes. Failing occasionally, the chef takes risks by tweaking the recipe based on their own style and taste. Eventually, the recipe transforms into an entirely new, enticing, and delectable result that makes your mouth water in anticipation. Having reached perfection, the chef will write the recipe down to more easily replicate it or to publish it in their next recipe collection. 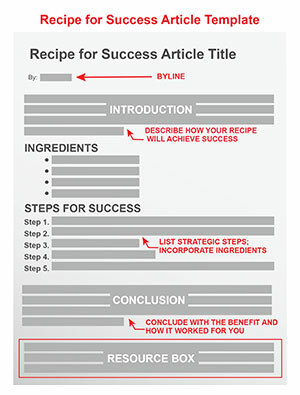 You can use this same concept by sharing your “recipes” with readers in your articles! Readers love recipe-formatted articles because it’s a model with which everyone is familiar and it incorporates proven steps. How are they proven? They are backed by your credibility as an Expert Author. Writing a recipe article is easy! Simply spend a little time thinking about your topic, its key ingredients, and the steps you took to achieve your goal. As you move forward in life, you’re conditioned. Don’t touch the hot stove. Look both ways before crossing the street. Pick your battles because life’s too short to fight over trivial things. Whether you fail or if you succeed (in your relationships, in your career, or even in your life), you’ve gained valuable experience that conditions you. It’s up to you to decipher what worked and what didn’t as you move forward. Think about those “hard knocks” in your career or someone who inspired you and how you or they overcame adversity. From more general life-based reflections to specific blunders in your niche, use these ruminations to write the perfect article for your readers.